We bet for research and development as the way to improve. We are pleased to inform you that the European Patent Office has granted us the patent EP16162779.9 – Industrias Ferri, S.A. for our Sistema de Abarloamiento para Rescate de Personas ( S.A.R.P.). Industrias FERRI, S.A. will be present at EURONAVAL FAIR 2018 OF PARIS. 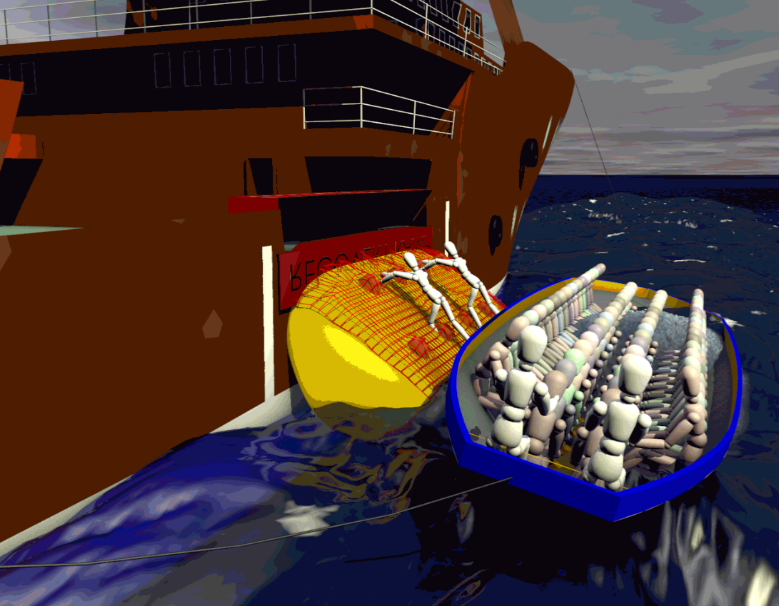 It is a system developed and patented by Industrias FERRI, S.A., unique in the world, designed to improve the safety of people in the rescue of precarious vessels in the open sea. At this moment we are working on the manufacture of the first prototype. The S.A.R.P. try to cushion the differences in movement between the lifeboat and the boat to ensure maximum safety for people and prevent accidents and drowning. It is installed on the side of the ship quickly and easily, and its operation is very simple. It develops in a short space of time, leaving one part submerged and the other on the surface. This will prevent the rescue boat from getting under the rescue boat acting as a defense and buffer between the two. Disembark easily from the boat, and access a rescue boat, as well as access from the water. Industrias FERRI S.A., leads the project Development of a autonomous platform for vigilance and defence in offshore environments, and The University of Vigo and Centre Internacional de Mètodes Numèrics en Enginyeria will cooperate too. The objective is the development of an autonomous reliable system for vigilancy operations in offshore environments capable to work in extreme sea conditions. Offshore environments is not only for wind farms and gas/petrol platforms, it is also for piracy areas, border areas, explosive or polluted atmospheares, etc. This R&D project was approved by the Ministry of Economy and Competitivity, in coordination with Secretaría de Estado de Investigación, Desarrollo e Innovación, Secretaría General de Ciencia, Tecnología e Innovación, Dirección General de Innovación y Competitividad and Subdirección General de Colaboración Público-Privada the 29th of september of 2014 throught the Programa Estatal de Investigación, Desarrollo e Innovación Orientada a los Retos de la Sociedad, in the frame of Plan Estatal de Investigación Científica y Técnica y de Investigación 2013-2016. To design, develop and manufacture a hydraulic maintenance system, with a moderate cost, to facilitate launch and recovery operations (from port and starboard) to auxiliary people in large vessels. To develop a new high-performance process for granite production (decreasing cut thickness by more than 60%) based on cutting with continuous metal lathe with diamond segments, reducing power consumption, and to create a demonstrator to test the new process. The design, development and manufacture of a special fairlead crane prototype for dynamic positioning large dredgers, able to withstand higher tensile stresses than those typically existing in the market, thanks to structural optimization of the whole. The design, development and manufacture of a mechanical device to be installed on oil tankers to enable the transfer of crude oil between these ships at sea, trying to make the operation as similar as possible to in-port operations. To design a new drill for ornamental rock markets different to those catered for to date, demanding drilling machinery (marble, ornamental rock in cold areas or areas with no water supply) by adapting a drill for granite developed by Ferri and improving the quality of the process by increasing dilling performance. The design, development and manufacture of four prototypes (one telescopic crane and three A-frames) in order to acquire the necessary knowledge to incorporate LARS for marine research equipment to the Industrias Ferri catalog. The systems must satisfy the following requirements: high cost-load ratio and simple assembly/disassembly processes.